Multi-talented, Anime celebrity. Exclusive first performance in Indonesia! Hailing from Nagoya, Japan, Aya Hirano landed her breakthrough role back in 2006, voicing the titular character of "Suzumiya Haruhi no Yuutsu". She also performed the theme songs for the anime. Since then, she has landed roles in hit anime such as "Lucky Star," "NANA," "Death Note" and "Fairy Tail". Alongside her voice-acting career, she is also active in the music scene, having released four albums and recently released her twelfth single, "TOxxxIC", in February 2013. She has also landed roles in both television and stage. She has appeared in television dramas, such as, "Myuuzu no Kagami" and "Konna ni Idol ja Nain". She is currently playing Eponine, in the Japanese production of the musical "Les Misérables". She has also played the role of Catherine, in the Japanese production of the musical of "Wuthering Heights". 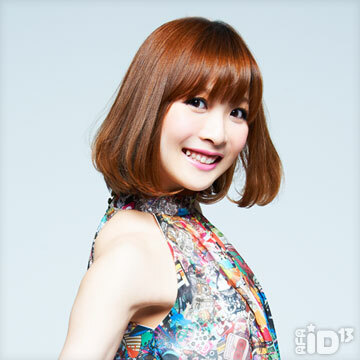 Catch her first ever performance in Indonesia right here at AFA Indonesia 2013! Top J-pop Female Vocalist – Direct from Japan! Exclusive first performance in Indonesia! 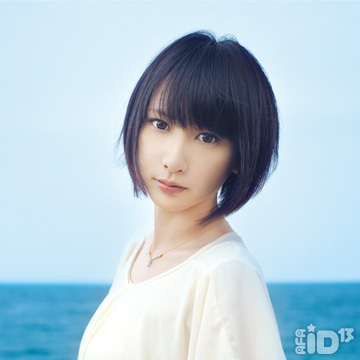 With her impressive and beautiful voice, Eir Aoi was selected to sing the ending song of the anime "Fate/Zero", entitled "MEMORIA", and was released on October 19, 2011. The single ranked eighth on the Oricon weekly singles chart. On April 11, 2012, Eir released "Prayer" (a tribute album for Servants appearing in "Fate/Zero"), and performed at a live event for the first time in her career on May 27th in Tokyo. After her first live performance, she has performed at several big live events, such as "Animelo Summer Live 2012", and released her second Single "AURORA" (opening song for the anime "Gundam AGE") on September 5th. On November 21st, her third single "INNOCENCE" (opening song for the anime "Sword-Art Online") was released and reached sixth place on the Oricon weekly singles chart. In 2013, Eir released her first full-length album "BLAU" on January 30th, which reached 4th on Oricon weekly album chart. In March, Eir was invited to SAKURA-CON in Seatte, USA, and made her first overseas live performance in front of an audience of five thousand. She is absolutely the hottest female vocalist right now in Japan. AFA Indonesia will be Eir's first live performance in Indonesia! Top Anisong and J-Pop Diva. Exclusive first performance in Indonesia! The name "May'n" is derived from her real name, and it demonstrates her hope to always "sing songs that will be everyone's main theme." In 2008, she performed as the singing voice of Diva of the Galaxy, Sheryl Nome, in the TV anime "Macross Frontier." She released two singles in the same year, both of which instantly became big hits, each placing in the top three on the Oricon Weekly Chart. The mini-album "May'n*Street" was released in January 2009, and achieved second place on the Oricon Weekly Chart. Since then, all of May'n's releases have consistently entered the top music sales charts. May'n held her first solo live concert in the Nippon Budokan in January 2010, with tickets completely sold out in a single day. It was followed by an Asia tour in March and a summer domestic tour covering seventeen performances in July. She works passionately on her live shows in Japan and overseas to deliver her songs directly. She successfully held her second solo Budokan concert in March 2011. She did her second Asia concert tour of six cities in 2011. She also participated in the largest Japanese Culture and Entertainment Festival in Europe, "Japan Expo 2011", and was well received by fans. On March 20, 2012, a special concert, "May'n*GO! AROUND!! ", was held at the Yokohama Arena, and the next day, on the 21st, her third album "HEAT" was released. In May 2012, "Chase the world", the opening theme of the anime "Accel World", was released and recorded the highest sales amongst all her works. From the end of May 2012, her first worldwide concert tour, "ROCK YOUR BEATS", began. May'n toured China, Germany, France, and Hong Kong and totalled thirty-four performances, including stops in Japan. On March 2, 2013, her third solo performance in the Nippon Budokan was her most recent notable success. She fascinates many audiences with her irresistible singing skills and unique voice, and continues to be the must-see "New Generation Female Rock Vocalist." 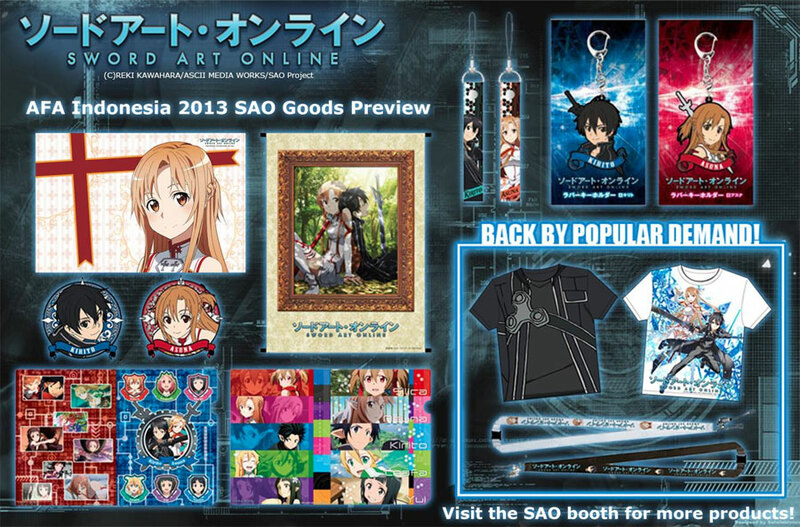 See her for the first time, exclusively at AFA Indonesia! The fusion of J-Pop Idols with Metal Rock Music. Exclusive first performance in Indonesia! In 2010, BABYMETAL was formed. When their first music video "Doki☆Doki Morning" debuted on Youtube, the initial shocking reaction it created was, "What did I just watch?!!" Through word-of-mouth, they began to gather more and more fans, accessing from all over the world, such as North America, South America, Europe, and Asia. In August 2012, they performed at one of the biggest music festivals in Japan, "SUMMER SONIC 2012", and became the youngest artistes ever to perform at SUMMER SONIC. In November 2012, BABYMETAL made their overseas performance debut at Anime Festival Asia Singapore 2012. Their major debut single (I.D.Z. Ijime, Dame, Zettai) has peaked on the Oricon daily charts at fifth, after its release in January 2013 and ranked sixth on the weekly charts. BABYMETAL has successfully reached the goal of hitting the TOP 10 with their first single. June 2013 will mark the release of their second major single, "Megitsune". BABYMETAL has sold out every live performance since their debut - October 2012 @ Shibuya O-EAST, December 2012 @ Akasaka Blitz & February 2013 @ ZEPP TOKYO. In June 2013, they will mark their biggest concert to date at the NHK Hall. BABYMETAL's "METAL RESISTANCE" around the world is growing larger by the day, at an increasing speed. Catch their first ever performance in Indonesia, only at AFA Indonesia! Top Electronic J-pop anisong duo direct from Japan! Exclusive first performance in Indonesia! 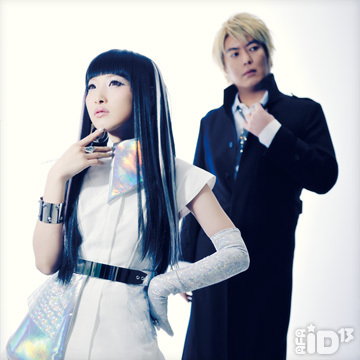 fripSide is a unit originally created by Satoshi Yaginuma (sat) in 2002. In 2009, Yoshino Nanjou joined the unit in its second iteration. Their first single of this iteration, "only my railgun", debuted at third place on the Oricon Weekly rankings. The follow-up single, "LEVEL5 –judgelight-", made its debut at fourth place. Both songs were used as theme songs for the anime "To Aru Kagaku no Railgun". From then, fripSide has released a string of hit songs. They welcomed their tenth anniversary in 2012 with a commemorative album, "Decade", as well as performing concerts in Tokyo and Osaka. In May of 2013, they once again partnered with the anime that propelled them to fame, coming up with the opening theme song for "To Aru Kagaku no Railgun S", "sister's noise". The single debuted at the top of the Oricon Weekly rankings. Catch their first ever performance in Indonesia, only at AFA Indonesia. Anime songstress trio direct from Japan! Exclusive first performance in Indonesia! 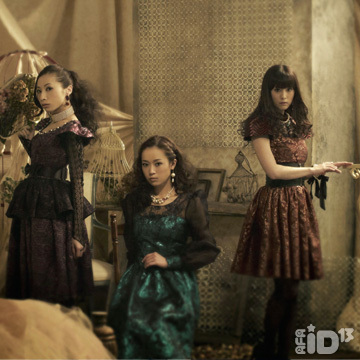 Hailing from Japan, Kalafina consists of three members, Wakana, Keiko and Hikaru. Produced by Yuki Kajiura, Kalafina made their debut in 2008 with "oblivious", the theme song for the theatrical release of the first "Kara no Kyokai"(The Garden of Sinners) movie. Since then, they have consistently charted in the top fifteen of the Oricon Weekly Charts. Kalafina has performed regularly live, both within Japan and overseas, including China, the United States, and South East Asia. As a result of the popularity of "Magia", the ending theme for the hit anime "Puella Magi Madoka Magica", Kalafina has performed to increasing numbers over the years. This year, Kalafina would be doing a nationwide tour of fifteen performances in nice Japanese cities, with a final performance on 4 August 2013, at the Tokyo International Forum Hall A. See their first performance in Indonesia only at AFA Indonesia! "Kara no Kyoukai"(The Garden of Sinners), Fate/Zero, PUELLA MAGI MADOKA MAGICA. Opening act on Friday, 6 September 2013! Angelina is the first Indonesian to be signed to Japanese talent agency. Discovered during a talent audition in 2012, she enjoys singing Japanese songs and performing them. She also counts dancing, cosplaying and translating Japanese lyrics into her native Indonesian language. Surprise guest on Saturday, 7 September 2013! Dempagumi.inc is a Japanese idol group, composed of six girls, Mirin Furukawa, Risa Aizawa, Nemu Yumemi, Eimi Naruse, Ayane Fujisaki, and Moga Mogami. The group belongs to Dear Stage, Akihabaraʼ's most famous idol live house and bar where they perform regularly. All of the members are geeks/otaku of anime, manga, games, or costumes. The group performed at Tokyo Collection and has collaborated with leading fashion designers including Mikio Sakabe. They attract attention overseas as well and have performed at fashion events in Jakarta and solo concerts in Taipei. Tickets for their solo concert at Zepp Tokyo were sold out. The unit released their latest single, 'Denden Passion' and ranked 6th on Oricon Chart. 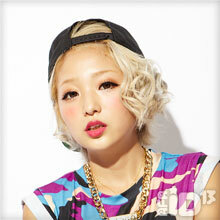 'The group joined a new record label, MEME TOKYO, produced by TOY'S FACTORY and Mofuku-‐‑‒chan. 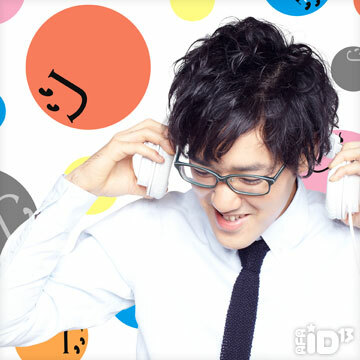 Japanese No.1 Ani-song DJ, opening act on Saturday, 7 September 2013! "Made his entry into the Japanese music scene in 2008, with his groundbreaking non-stop DJ mixes based on J-Pop and Anime songs. Can count many performances at worldwide Anime Festivals under his belt, such as ANIMAX MUSIX and Italy's largest comics festival, Lucca Comics and Games. In addition to all this, his mix CDs have surpassed 600.000 units in sales in Japan." Concert VIP Autograph Announcement for AFA Indonesia! Here is the chance to meet your favourite artiste and get a special autograph poster hand delivered to you. Autograph balloting for VIP ticket holders will be on-site at the venue after the redemption of tickets. 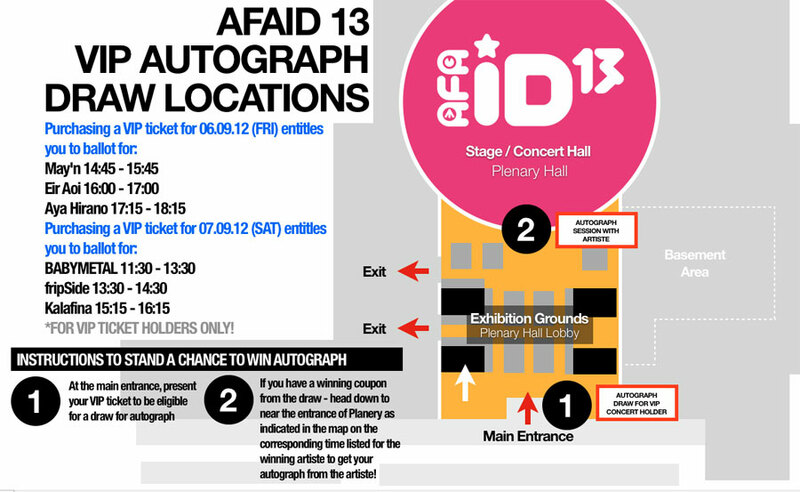 After the collection of your ticket(s), proceed to the autograph drawing counter located at the entrance of the event. There, you will draw from the box for the artiste of your choice. You are limited to one drawing chance for each VIP ticket you have purchased and to artistes for the day of the ticket that you have bought. There are two kinds of coupons, one is for a successful draw, the other is for an unsuccessful draw. If you are successful, you will be given a coupon that allows you to attend the autograph poster giveaway session. There will only be 100 autograph allocated for each artiste and based on a first come first served basis. Autograph balloting for each artiste ends 30 minutes before the start of each artiste's session Eg, if the autograph session is at 1pm, the balloting closes at 12.30pm, even if coupons have not been allocated. Please turn up on time for the autograph poster giveaway session. Once the last person in the queue has gotten their autograph, the session will end. Latecomers will not be entertained. The autographs would be done on posters provided by the Organizers. The artistes will not sign on personal items handed over to them. Please note that photography and video recording, but not limited to, during the autograph poster giveaway session is strictly prohibited. The decisions of the Organizers are final and reserve the right to amend any of the conditions without notice. Have you ever been to a combined Maid and Butler cafe? 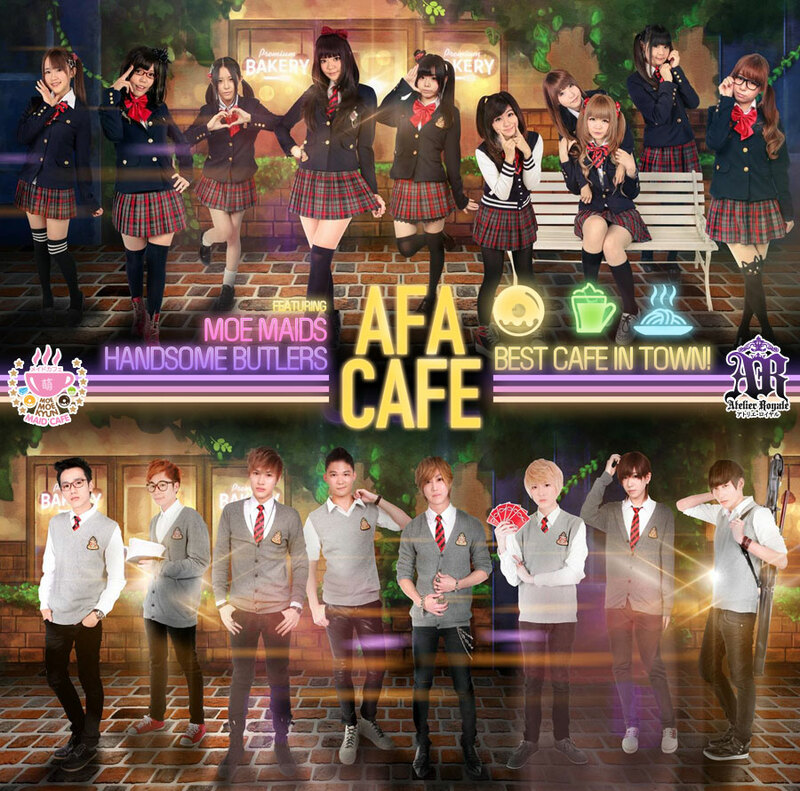 After a successful outing at Funan Anime Matsuri, AFA's exclusive Atelier Royale Butler Cafe and Moe Moe Kyun Maid Cafe will come together once again to bring you a uniquely memorable combined cafe experience, here at AFAID 2013! Goshujin-sama and Ojou-sama, do come by the AFA Cafe this September to enjoy a most delightful tea session served by our charming butlers and kawaii maids in school uniforms! Find out more! Check out the official Facebook pages! 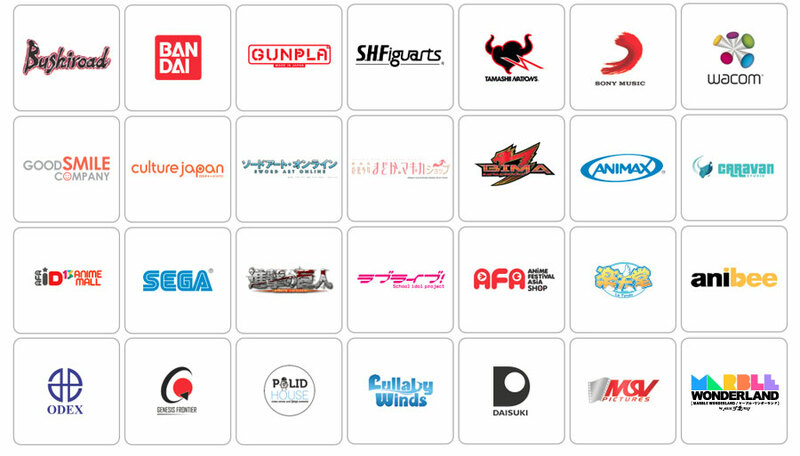 Apart from the concerts, AFA ID 2013 will have something for everyone, depending on their interests. 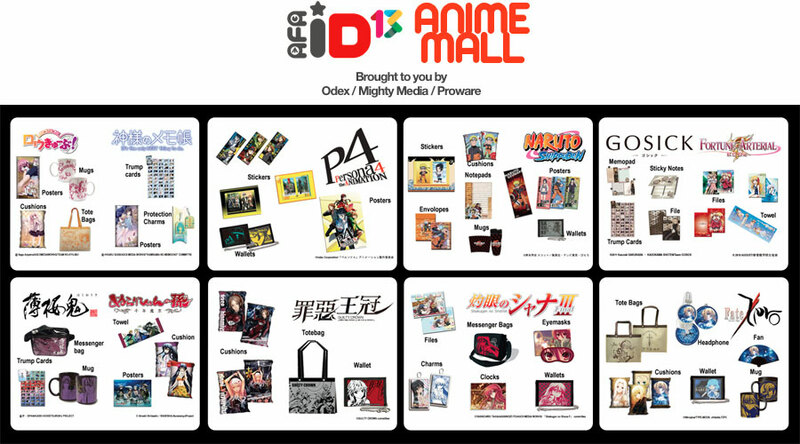 Avid shoppers can look forward to one of the largest collection of original anime merchandise from Akiba Town by some of Japan's top brands. More details on participating brands will be announced at a later date. Anime Festival Asia Indonesia will be hosting the qualifying rounds for the AFA Regional Cosplay Championship, the most prestigious cosplay competition in South-East Asia. 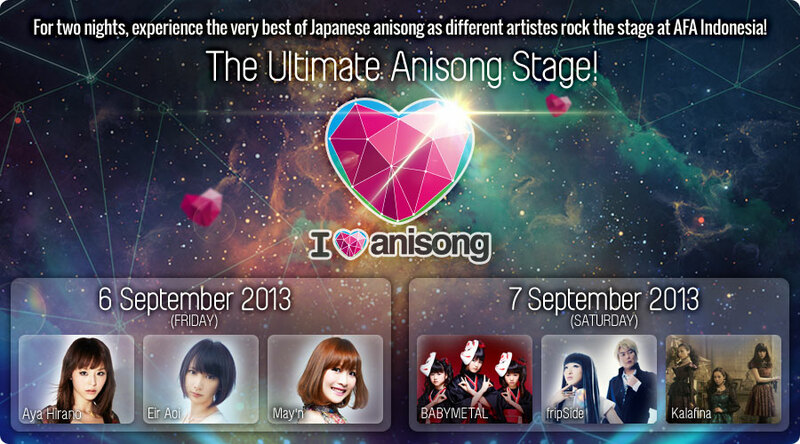 Come cheer them on the AFA Main Stage at AFAID13 on Sunday, September 8th, 2013! Find out who will be representing Indonesia to participate in the ARCC Final held in Singapore this November! "Exhibition + Stage" tickets for Sunday, 8 September 2013, grants you acesss to view this competition. Contestant competition entry team will be chosen by judges through video selection. Contestant team who passed the video audition shall be announced on AFA ID website. Upload the audition video on internet. Privacy settings are recommended. Before the competition, contestants are to submit stage performance details. The winner will continue to compete in the ARCC Regional Competition held in Singapore in November 2013. Peserta yang lulus ke tahap kompetisi adalah tim yang dipilih oleh dewan juri melalui Video (tidak perlu foto). Peserta yang lulus Video Audisi akan diumumkan di webnya AFA ID. Maksimal 30 detik, tidak ada toleransi kurang atau lebih. Diupload ke youtube dengan setting privacy. Sertakan link video di email pendaftaran. Sebelum kompetisi, kontestan wajib mengirimkan detil penampilan di panggung. Pemenang dari ARCC ID akan bertanding di ARCC FINAL yang diadakan di Singapura bulan November 2013. Restricted to Japanese intellectual property including, but not limited to : anime/ manga, game, novels & live-action. Characters in the team must be from the same intellectual property. Participants are to provide the title of the intellectual property, plus the name and picture of the character they are cosplaying. 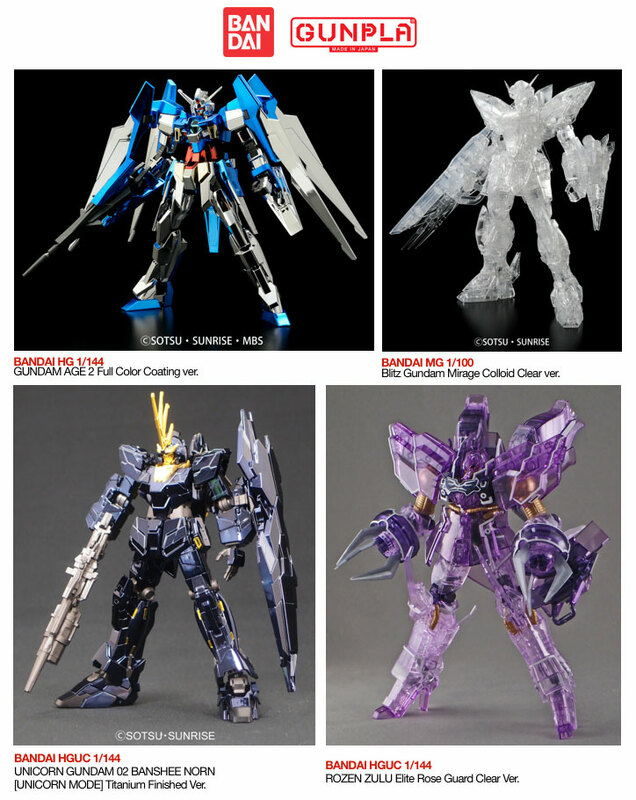 Original, generic and self-modified characters from media of Japanese origin are not eligible. Each participation entry must have a team/performance name. Each contestants is represented by a team of two cosplayers. Competition is open to those residing Indonesia only. Participants under the age of 17 will require consent from a parent or guardian to enter the tournament. Each team is allowed to have 2 helpers. AFA reserves the right to use images, video clips of participant's cosplay and performances prior and after the tournament. Participants will be judged based on 30 second video of draft performance. The AFA Cosplay Committee reserves the right not to publish cosplayers as participants on the organiser website if they have failed to provide the relevant and/or necessary information required for registration. Reference pictures provided by the finalists will be compared with the cosplay photos back stage before the performances. Character write-up and other media provided by the finalists will be compared with the finalist's character acting. The finalist will be judged on the stage directions, movement, and entertainment value of the performance piece. Entertainment value will take up 30% of the performance score. Technical directions will take up 10% of performance score. The quality of the costume will be reviewed backstage before the performance. • For commissioned costume(s), the participating group will have to bear a 5% score-handicap. • For purchased costume(s), the participating group will have to bear a 10% score-handicap. All information furnished by the contestant to the organiser should be truthful to the best of knowledge of the contestant. Contestant is responsible for condition of his/her costume at all times. Contestant should voice any difficulties to the AFA Cosplay Committee prior to the Championship. Contestant backing out of the Championship has to give official notice to the organiser at least 1 month prior to the Championship. Contestant is responsible for the condition of any music or video to be played during his/her performance. Contestant should remain contactable during any reasonable time before the Championship. In the case whereby contestant is unable to be contacted for a period of time, this period of time has to be make known to the AFA Cosplay Committee. Peserta akan dinilai berdasarkan video penampilan kasar berdurasi 30 detik. *Gambar yang diedit secara digital akan mengurangi nilai. Komite Cosplay AFA berhak untuk tidak mempublikasi video peserta jika ada informasi pendaftaran yang belum dilengkapi oleh peserta tersebut. Dewan juri akan menilai keakuratan kostum dengan referensi gambar yang diberikan peserta di belakang panggung. Dewan juri akan menilai keakuratan penjiwaan karakter di dalam akting panggung dengan keterangan sifat karakter yang diberikan oleh peserta secara tertulis. Dewan juri akan menilai penguasaan panggung, pergerakan dan nilai hiburan dari masing-masing penampilan. Besar nilai hiburan adalah 30% dari total nilai penampilan. Besar nilai teknis penampilan di panggung adalah 10%. Dewan juri akan membahas kualitas kostum di belakang panggung sebelum penampilan. • Untuk kostum dan props yang dibuatkan oleh orang lain akan mengurangi nilai sebanyak 5%. • Untuk kostum yang beli jadi akan mengurangi nilai sebanyak 10%. Semua informasi yang diberikan peserta kepada panitia wajib yang benar dan terbaik Contestant is responsible for condition of his/her costume at all times. Peserta harus dapat dihubungi oleh panitia selama persiapan kompetisi. Beritahukan kepada panitia jika ada waktu tertentu yang tidak bisa dihubungi. Good news, tradition of Cosplay Singles Showcase continue in 2013!! All cosplayers from all nations, hear our call and let's join! Same as last year, there will not be any need for skits or performances, just awesome cosplays will do! Our guest judges will be walking around the event halls on 07th September 2013 (SAT) to search for AFA's favorite cosplayer! If you have an awesome costume waiting to show off to the crowds at AFA, you may stand a chance to be picked to be AFA's favourite cosplayer on stage and stand to win fantastic prizes! Our cosplay guest judges (6 judges: Kaname, Reika, Richfield, Ying Tze, Angie, and Clive) will walk around the event halls on Saturday, 07 September 2013 start from 12:30 to 14:30. They will then issue out 'YOU HAVE BEEN CHOSEN' cards to their favourite cosplayers as well as take a picture with them. Each card will come with a small slip, of which the cosplayer will have to return with their particulars of their cosname, cosplayed character name and series, contact number and email address. Cosplayers who have been chosen by receiving the card shall go to the rendezvous spot as mentioned on card from 14:00 to 15:00, to cosplay in the same costume on stage, on same day! Kabar baik kawan2, tradisi dari Cosplay Singles Showcase kembali ada di tahun 2013!! Seluruh cosplayer se-nusantara, simak dan ikutilah!! Sama seperti tahun sebelumnya, tidak ada skit atau performance, hanya cosplay terbaik saja yang ikut! Para juri tamu kita seperti Kaname, Reika, dll, akan berjalan di sekitar tempat kegiatan pada tanggal 07 September 2013 (Sabtu) untuk mencari AFAID's Favorite cosplayer! Jika kamu memakai kostum yang luar biasa untuk ditunjukkan ke keramaian dari AFAID, maka kamu berkesempatan terpilih menjadi AFAID's Favorite cosplayer di panggung dan berpeluang memenangkan hadiah yang fantastis! Para juri tamu kami (6 juri: Kaname, Reika, Richfield, Ying Tze, Angie, dan Clive) akan berkeliling di tempat kegiatan pada hari Sabtu, 07 September 2013 dimulai dari pukul 12:30 sampai 14:30. Mereka akan memberikan kartu bertulisan 'YOU HAVE BEEN CHOSEN' kepada favourite cosplayers mereka sekaligus berfoto bersama. Setiap kartu akan diberikan bersama kartu petunjuk, yang nantinya dikembalikan ke panitia dengan data berisi nama cosplay, nama karakter cosplay dan judulnya, nomor kontak dan alamat email. Cosplayer yang terpilih dan menerima kartu harus menuju ke titik pertemuan yang di jelaskan dalam kartu dari pukul 14:00 sampai 15:00, untuk cosplay dengan kostum yang sama di panggung di hari yang sama! Previously known as the Artist Alley, the Creators Hub area is a dedicated area for all budding artists! With booths selling fan-made merchandise such as bookmarks, posters to doujins, be spoiled this year at the Creators Hub at AFAID13! Comic Exhibition Indonesia (COMBINI) is a proposed event from a group of doujin/fanworks enthusiasts. Formed in 2012, this group has since undertaken the task of organising doujinshi events for the ever growing Indonesia local creators. 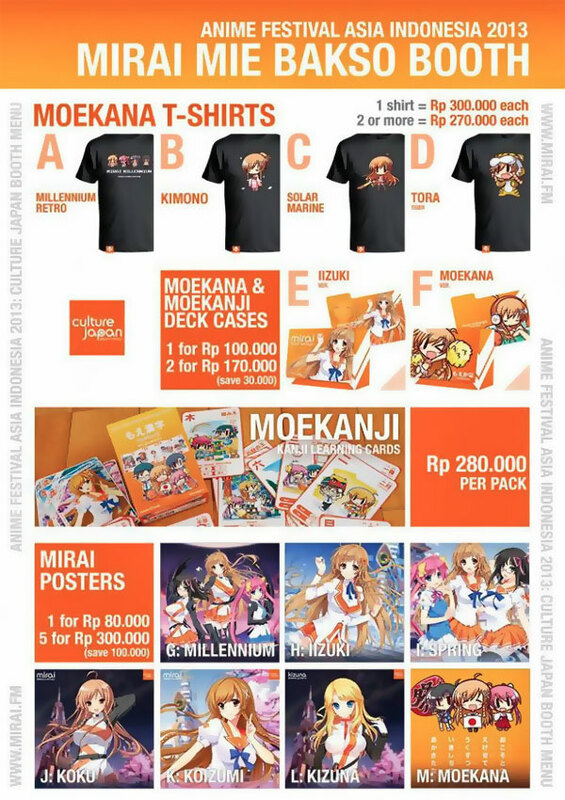 Now the group called "Combiners" is now trying to make the first huge leap by supporting one of the largest Japanese pop culture event in South East Asia, "Anime Festival Asia". On 19th August, a Culture Entertainment Show that showcases a collection of Japan's "Kawaii" Culture was held at Akasaka Blitz. "Marble Wonderland by Asia Kawaii Way" is a new Culture Entertainment Show that transmits to the world Japan's "Kawaii" power that has never existed till today through a selection of "Kawaii" from every aspect of Tokyo Fashion Pop Culture. A 30-minute show packed with cuteness including Denpagumi.inc's live show and Tokyo Kawaii fashion show.